This four-seat low-wing cabin monoplane was designed by the talented Willy Messerschmitt in response to a 1933 German Air Ministry requirement for an aircraft to participate in the Challenge de Tourisme Internationale air race of 1934. A very advanced design for its time, the Messerschmitt M37, as it was first known, was the first aircraft of its size to use all-metal stressed skin construction. 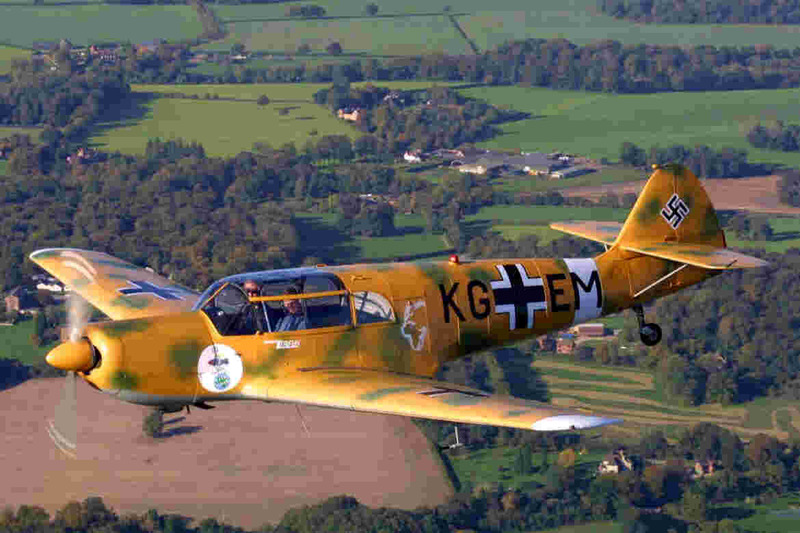 Soon given the official designation Bf 108, the experience gained by Messerschmitt in developing this aircraft led to the most important German fighter of World War II, the Messerschmitt 109. The relationship between the two types is immediately obvious, especially in flight. First flight tests of the Bf 108 in spring 1934 proved very satisfactory and the aircraft quickly established a reputation for pleasant handling and easy maintenance. In 1935 the German woman pilot, Elly Beinhorn, flew a circular trip from Germany to Istanbul and back to Berlin, a total of 2,230 miles (3,568km) in one day. She not only established a name for herself, but she also gave the aircraft its name "Taifun" (Typhoon). Following various race wins in 1938, a modified example set an international altitude class record of 29,766 feet (9,075m) in July 1939. By the outbreak of World War II, the Bf 108 was in widespread service with the Luftwaffe as a communications and ferry aircraft. By 1942 over 500 had been produced before production was transferred to SNCA du Nord factory in France. Altogether 885 Bf 108s had been produced by the end of the war. Post-war, French production continued through many different models, known by then as Nord 1001 and 1002 Pingouins (Penguins). This particular aircraft is officially a Nord 1002 and was first used by the French Air Force with the serial E274, it was declared surplus and then civilian registered as F-BFBV in 1951. The aircraft was completely restored during 1973 by the Champlin Fighter Collection in Texas where the aircraft resided until it was purchased and imported to the UK in the spring of 1999. During its overhaul it was found that most of the components had been produced during 1942-44, so the aircraft is unquestionably a genuine World War II aircraft, and would have originally been produced as a Messerschmitt Bf 108B-2. As part of its 1973 rebuild, the aircraft's original Renault engine was exchanged and it is now powered by a Lycoming 0-540. The aircraft is finished in desert camouflage to represent KG+EM, one of only two aircraft operated by Sonderkommando Blaich in North Africa in spring 1942. The other aircraft was a Heinkel He 111 bomber. This tiny unit was set up specifically to counter the British Long-Range Desert Group and SAS in the desert. Theo Blaich, the commander of the unit which carried his name, was aware that the Free French held the outpost of Fort Lamy (nowadays known as N'Djamena) in Chad. This was of major strategic importance to the Allies as a resupply base. Shortly before General Rommel launched a major offensive with his Afrika Korps in January 1942, Blaich persuaded Rommel to allow him to attack the fort. However, this attack would require a round trip of some 2,500 km, well outside the usual range of German or Italian aircraft based in North Africa. Therefore, Sonderkommando Blaich was set up specifically for this mission. On 21 January 1942 the unit set off, the Messerschmitt Bf 108 accompanying the Heinkel from their base in Libya. The aircraft achieved total surprise and successfully bombed Fort Lamy, destroying all oil supplies and 10 aircraft on the ground.